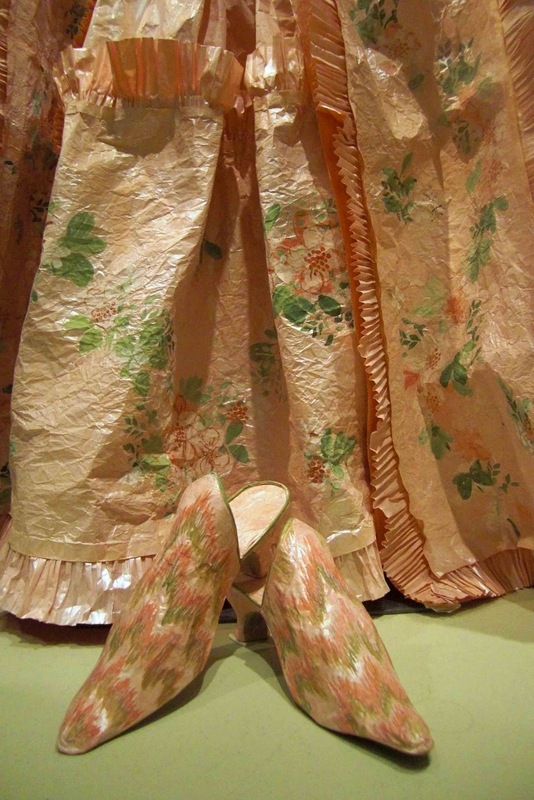 Isabelle de Borchgrave's paper dresses are nothing like the pop art shifts of the 1960's. "Pret A Papier" at the Hillwood Museum in Washington, DC presents dresses, hats, bags and shoes spanning two centuries of fashion. Some were created in response to paintings or historic costumes in the Hillwood collection. Ms. De Borchgrave translated everything into a different medium. She had to make choices. How close does one hew to each fabric's drape and texture? What about embroidery, buttons, beading? The change from fabric to paper is transformative. At first glance, they look like the real thing, but I never totally forgot that these fashions are paper. Pearlescent paint evokes satin. Twisted papers stand in for silk cording. This is a detail of an 18th century confection. It is historically correct, down to the pleated trim and "bargello needlework" shoes. The remaining "paperness" added to my enjoyment. These marvels of engineering and problem-solving will be on exhibit until December 30. Go see them if you can!